타 병원 내시경 조직검사에서 위암으로 진단되어 의뢰된 환자의 내시경 재검에서 암이 나오지 않아 당혹스러웠던 경험은 없으십니까? 많은 분들이 그런 경험을 가지고 계실 것입니다. 감추고 싶은 쓰린 경험이었겠지만. 그런 사례들을 모아 논문으로 꾸몄습니다. 몇몇 저널에 투고했으나 대부분 reject 되었습니다. 금방 reject 되었습니다. "너희가 검사를 못해서 그런 것이다" 투의 comment가 쓰인 reject letter를 받으니 묘한 기분이더군요. Thomas Kuhn이 '과학혁명의 구조(The Structure of Scientific Revolutions)'에서 설명한 바로 그 폐쇄성을 느꼈습니다. Normal science에서 벗어난 결과는 일단 무시하는 것이 학계의 기본 성향인 모양입니다. 물론 인정합니다. 위암의 조직검사에서 암이 확인되면 정상이고, 암이 확인되지 않으면 비정상입니다. 그런데 늘 그런 것도 아닙니다. 우리 모두 경험으로 알고 있습니다. Fellow 시절에 교수님의 위암 환자를 검사하여 조직검사에서 암이 나오지 않으면 무척 곤란한 일이 벌어집니다. 아마 불려가서 혼난 분도 계실 것입니다. 불편한 전화를 받은 분도 계실 것입니다. 그런 경험은 모두 비정상일까요? 저만 유난히 못난 것일까요? 교수가 직접 검사하면 항상 암이 나올까요? 감추고 싶은 불편한 진실은 무엇일까요? 마침내 한 저널에서 저희 자료를 accept 해 주었습니다. 고마운 일이 아닐 수 없습니다. 감사합니다. 여러분의 예상처럼 제목 또한 조금 이상합니다. Negative Biopsy after Referral for Biopsy-Proven Gastric Cancer. BACKGROUND/AIMS: Repeat endoscopy with biopsy is often performed in patients with previously diagnosed gastric cancer to determine further treatment plans. However, biopsy results may differ from the original pathologic report. 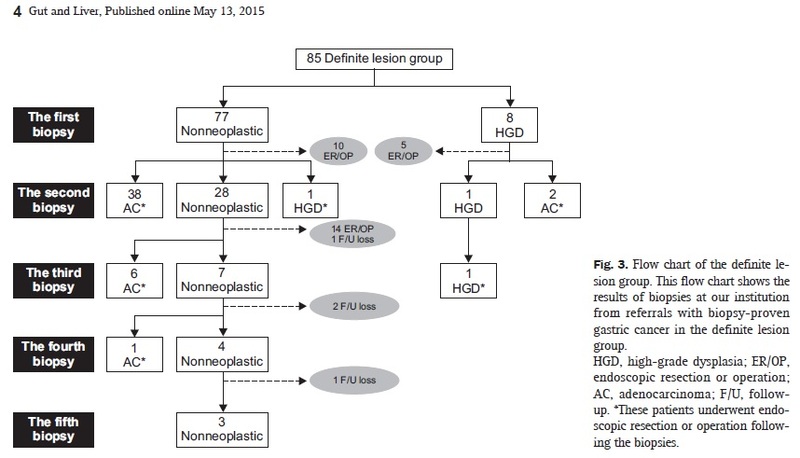 We reviewed patients who had a negative biopsy after referral for gastric cancer. METHODS: A total of 116 patients with negative biopsy results after referral for biopsy-proven gastric cancer were enrolled. Outside pathology slides were reviewed. Images of the first and second endoscopic examinations were reviewed. We reviewed the clinical history from referral to the final treatment. RESULTS: Eighty-eight patients (76%) arrived with information about the lesion from the referring physician. Among 96 patients with available outside slides, the rate of interobserver variation was 24%. Endoscopy was repeated at our institution; 85 patients (73%) were found to have definite lesions, whereas 31 patients (27%) had indeterminate lesions. In the group with definite lesions, 71% of the lesions were depressed in shape. The most common cause of a negative biopsy was mistargeting. In the group with indeterminate lesions, 94% had insufficient information. All patients with adequate follow-up were successfully treated based on the findings in the follow-up endoscopy. CONCLUSIONS: A negative biopsy after referral for biopsy-proven gastric cancer is mainly caused by mistargeting and insufficient information during the referral. 자세한 내용은 논문을 읽어보시기 바랍니다. 제가 강조하고 싶은 것은 이것입니다. "몇 번 검사하다보면 대부분 언젠가는 암으로 나오지만 전부가 다 암으로 나오는 것은 아니다." 나쁜 결과는 딱 한명이었습니다. 의사의 권유를 따르지 않았던 분입니다. 추적 내시경을 받지 않고 지내다가 5년 만에 보만 4형 진행성 위암으로 진단되었습니다. .
임상강사, 전공의 여러분. 혹시 교수님 환자의 조직검사에서 위암이 나오지 않더라도 너무 실망하지 마십시오. 남들도 그런 경험을 많이 가지고 있습니다. 다만 감추고 있을 뿐입니다. '환자-의사 관계'가 좋으면 모두 좋은 결과가 나옵니다. 적절한 추적관찰이 중요하다고 생각합니다.